I couldn't help notice that while the thread says Roman keys and locks you don't actually have any pictures of locks. I happen to have two Roman padlocks in my collection and am attaching pictures below. Neither lock is functional but it is possible to figure out how they worked. Interestingly, both have a secret latch that must be pivoted out of the way before the keyhole would be exposed. One male, one female. BBE. Thanks for showing us your roman padlocks. You are correct in that we don’t as yet have any examples of complete Roman locks, although we do have many more Roman keys to add to that section. Most of the keys shown are lift and slide, would I be correct in that your locks would have been of the spring barb type but with a turning key? It’s nice that your locks also seem to depict a deity, have you identified them? From the iron rust residue in the lock that opens I can determine that it would have required a drilled key, what you call a pipe key in the UK, and there was a sliding bolt for the shackle that appears to have had a spring to keep it in place. I also have a drilled key in my collection that appears to be the correct style although it is too large for this lock and it doesn't have a point that could have been used to slide or pivot the cover retention plate. The dieties are probably Zues and Hera but I am just guessing there. In all my perusing of ancient Roman lock bolts and keys I find it interesting that I have never found a bolt and a key that are compatible of the lift and slide type. In fact I have noted that the keys are typically much too large to engage any of the bolts. The technology improvements in locks, especially basic mechanisms has always held great interest for me. The Roman's seemed to use mechanisms from other sources and as near as I can determine originated the rotating bit key unless you want to consider the older Greek sickle keys as very rudimentary bit keys. I have often thought of building a working model of the padlock on a fairly larger scale as I imagine it would have been made but like most of us time is the biggest obstacle. 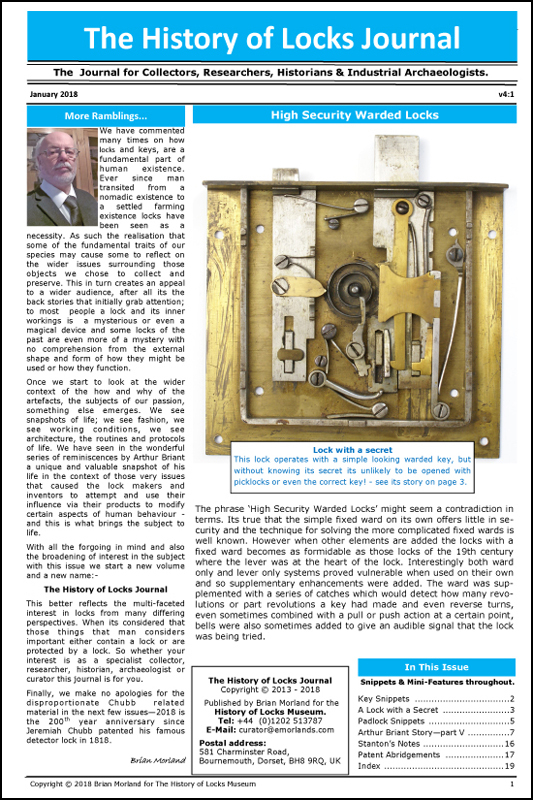 "In all my perusing of ancient Roman lock bolts and keys I find it interesting that I have never found a bolt and a key that are compatible of the lift and slide type. In fact I have noted that the keys are typically much too large to engage any of the bolts." here is a key and a bolt that could work together. Very nice. That is a first for me. All of the keys and bolts I have are incompatible by size as well as configuration. For how many months finding Roman keys this one has triggered me. It is very unique! Thanks! Keep on spreading this information. Roman keys are perfect for antique-inspired houses. Looks great.